← Carbon Storage and Restoration: The Only Way Forward! When I left the Osa Peninsula in the summer of 2014, I thought I might never return. The trip had been a life changing experience for me and the peninsula was the most wonderful and exciting place I had ever been. Unfortunately, it is not the easiest place to get to from Scotland. I assumed life would lead me down other paths. Last June I graduated from university with a degree in zoology and little idea of what to do next. All I had was a vague notion that I wanted a job in active conservation work. Six months later I found myself boarding a plane to Costa Rica, to return to the Osa Peninsula where I had had my first experience of wildlife conservation. As a research assistant on the sea turtle programme at Osa Conservation, I monitor the beaches daily; collecting data on nesting turtles, tagging adult females, and helping hatchlings to reach the ocean. 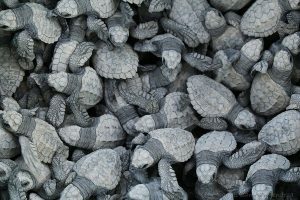 Just last week I saw my first green turtle hatchlings. 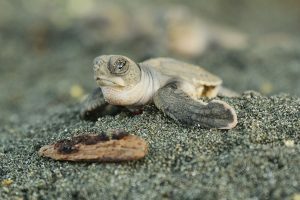 Eleven little turtles had been left behind from a mass hatching, tangled in tree roots that had threaded their way through the nest during incubation. Conservation can be a disheartening field to work in. We are faced with so many problems to overcome and it is easy to question whether or not our attempts are actually making a difference. All I can do is hope that my actions as an individual will make a small contribution to the bigger picture. The data that I collect as a research assistant can be used to protect the population of turtles which depend on these beaches to nest. Each piece of litter I pick up from the beach is one less piece damaging our marine environment and the amazing creatures that depend on it to survive. 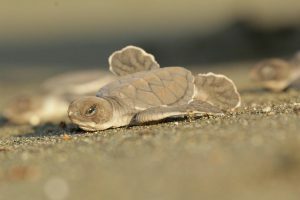 Every hatchling that I help to reach the ocean is another chance for an adult to return here to nest in 30 years’ time. Every nest I relocate to a safer site could mean a hundred little chances for an adult to return. As a graduate I entered the ‘real world’ with a hope to make a small difference in the fight to save our environment and the wildlife that shares this world with us. I hope my time spent here working for Osa will be my first step in fulfilling that dream.